From the early 1970s until 1981, ground-water development in the Goose Lake basin underwent rapid growth. The number of new wells constructed and total State-permitted ground-water withdrawals for irrigation reflect the increase in ground-water development that occurred during this period. A strong agricultural economy spurred much of the development by providing incentives to expand irrigated acreage and modernize irrigation methods (from gravity to sprinkler systems). The drought of 1976-77 also encouraged farmers to develop ground water as a supplemental source to less reliable surface-water supplies used in the past. 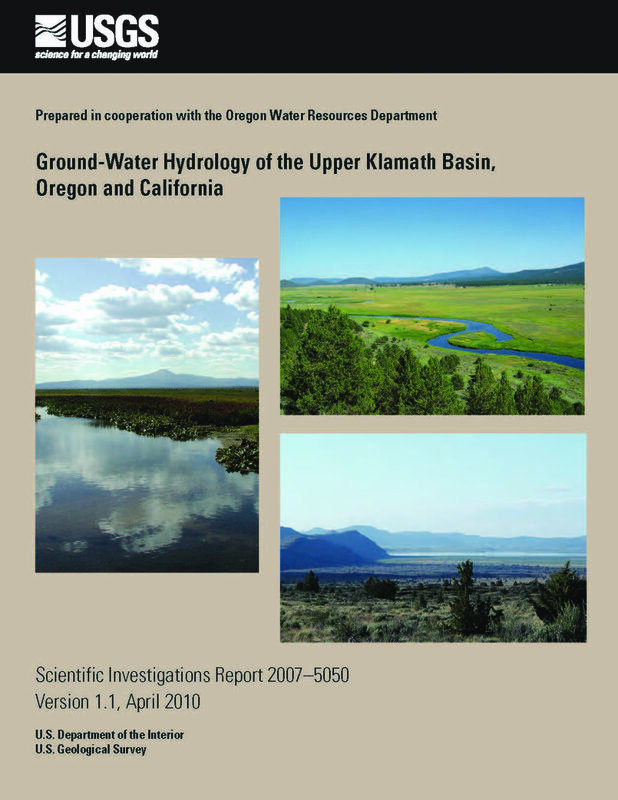 A preliminary assessment of the basin by OWRD staff (R. B. Almy, Oregon Department of Water Resources, written commun., 1981) concluded that, based on rates of water-level decline and increases in withdrawals, further and more detailed study of the basin was warranted. Between 1975 and 1982, water-level declines in some OWRD observation wells ranged from 0.5 to 3 feet per year, while permitted ground- water withdrawals increased at an average rate of 4,000acre-feetperyear(acre-ft/yr). Similarwater-level declines and increases in withdrawals occurred near Davis Creek on the California side of the basin during this period. This prompted a 1982 assessment of ground-water conditions by the California Department of Water Resources (California Department of Water Resources, 1982). At the time of OWRD's assessment it was felt that too little information on the actual rates of ground-water use, recharge, and the geohydrology of the aquifer system was available to allow proper management of the resource. If the rates of water-level decline and ground-water withdrawal that existed prior to 1981 had continued, issuance of new permits for ground-water use potentially could have been halted in order to determine if the Goose Lake basin should be designated as a "criticalground-water area." Sucha designation would allow the State of Oregon to limit the use of ground-water resources in the area. However, overdraft of the ground-water resource became a less urgent issue after 1982, when a downturn in the agricultural economy, combined with rising costs of electrical power (and thus pumping), resulted in a widespread reversion to dryland farming and low-water-use crops. Adverse agricultural market conditions halted the growth of ground-water development in the basin; these trends could conceivably reverse in the future to spur growth again. In recognition of this potential and the need to build an understanding of the basin in order to properly manage future ground-water development, OWRD entered into a joint program of study with the U.S.Geological Survey. 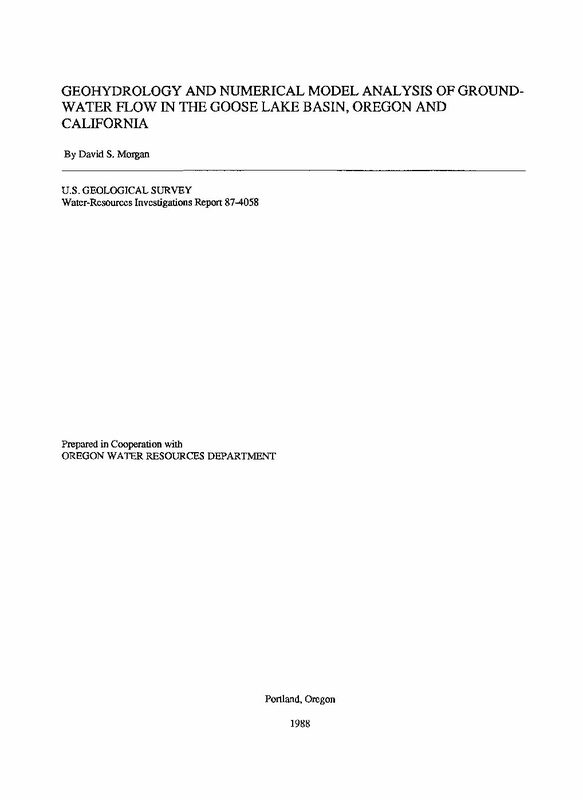 The first of a proposed series of ground-water basin assessments, this 1-year study was started in 1986 with the goals of characterizing the nature, extent, and properties of water-bearing rocks within the basin and describing and quantifying the components of recharge to, and discharge from, the basin. 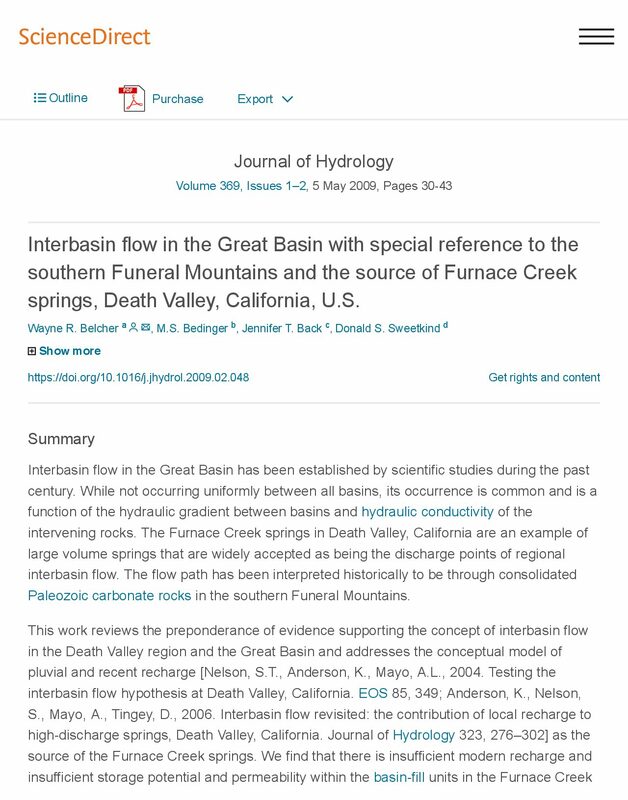 Additionally, this study was designed toe valuate the adequacy of available and readily collectable information to quantitatively describe the geohydrology of the basin. If this information was found to be inadequate, the study would also identify the data needed to better describe, understand, and manage the ground-water resource. (2) develop a ground-water model that would simulate the response of the hydrologic system to applied stresses and that could be used to estimate the probable hydrologic effects of various development alternatives. This report presents the results of the investigation. (4) compilation of existing data reports and drillers 1 logs to obtain estimates of geohydrologic characteristics of the ground-water reservoir. (4) simulate the effect of various possible developmental alternatives on Carson River outflow, evapotranspiration, ground-water levels, and ground-water storage in the valley. The upper Klamath Basin spans the California-Oregon border from the flank of the Cascade Range eastward to the Basin and Range Province, and encompasses the Klamath River drainage basin above Iron Gate Dam. Most of the basin is semiarid, but the Cascade Range and uplands in the interior and eastern parts of the basin receive on average more than 30 inches of precipitation per year. The basin has several perennial streams with mean annual discharges of hundreds of cubic feet per second, and the Klamath River at Iron Gate Dam, which represents drainage from the entire upper basin, has a mean annual discharge of about 2,100 cubic feet per second. The basin once contained three large lakes: Upper and Lower Klamath Lakes and Tule Lake, each of which covered areas of 100 to 150 square miles, including extensive marginal wetlands. Lower Klamath Lake and Tule Lake have been mostly drained, and the former lake beds are now cultivated. Upper Klamath Lake remains, and is an important source of irrigation water. Much of the wetland surrounding Upper Klamath Lake has been diked and drained, although efforts are underway to restore large areas. Upper Klamath Lake and the remaining parts of Lower Klamath and Tule Lakes provide important wildlife habitat, and parts of each are included in the Klamath Basin National Wildlife Refuges Complex. The upper Klamath Basin has a substantial regional ground-water flow system. The late Tertiary to Quaternary volcanic rocks that underlie the region are generally permeable, with transmissivity estimates ranging from 1,000 to 100,000 feet squared per day, and compose a system of variously interconnected aquifers. Interbedded with the volcanic rocks are late Tertiary sedimentary rocks composed primarily of fine-grained lake sediments and basin-filling deposits. These sedimentary deposits have generally low permeability, are not good aquifers, and probably restrict ground-water movement in some areas. The regional ground-water system is underlain and bounded on the east and west by older Tertiary volcanic and sedimentary rocks that have generally low permeability. Eight regional-scale hydrogeologic units are defined in the upper Klamath Basin on the basis of surficial geology and subsurface data. Ground water flows from recharge areas in the Cascade Range and upland areas in the basin interior and eastern margins toward stream valleys and interior subbasins. Ground water discharges to streams throughout the basin, and most streams have some component of ground water (baseflow). Some streams, however, are predominantly ground-water fed and have relatively constant flows throughout the year. Large amounts of ground water discharge in the Wood River subbasin, the lower Williamson River area, and along the margin of the Cascade Range. Much of the inflow to Upper Klamath Lake can be attributed to ground-water discharge to streams and major spring complexes within a dozen or so miles from the lake. This large component of ground water buffers the lake somewhat from climate cycles. There are also ground-water discharge areas in the eastern parts of the basin, for example in the upper Williamson and Sprague River subbasins and in the Lost River subbasin at Bonanza Springs. Irrigated agriculture is an integral part of the economy of the upper Klamath Basin. Although estimates vary somewhat, roughly 500,000 acres are irrigated in the upper Klamath Basin, about 190,000 acres of which are part of the Bureau of Reclamation Klamath Project. Most of this land is irrigated with surface water. Ground water has been used for many decades to irrigate areas where surface water is not available, for example outside of irrigation districts and stream valleys. Ground water has also been used as a supplemental source of water in areas where surface water supplies are limited and during droughts. Ground water use for irrigation has increased in recent years due to drought and shifts in surface-water allocation from irrigation to instream uses. The shifts in surface-water allocation have resulted from efforts to improve habitat for fish listed under the Federal Endangered Species Act. The ground-water system in the upper Klamath Basin responds to external stresses such as climate cycles, pumping, lake stage variations, and canal operation. This response is manifest as fluctuations in hydraulic head (as represented by fluctuations in the water-table surface) and variations in ground-water discharge to springs. Basinwide, decadal-scale climate cycles are the largest factor controlling head and discharge fluctuations. Climate-driven water-table fluctuations of more than 12 feet have been observed near the Range, and decadal-scale fluctuations of 5 feet are common throughout the basin. Ground-water discharge to springs and streams varies basinwide in response to decadal-scale climate cycles. The response of the ground-water system to pumping is generally largest in areas where pumping occurs. Annual drawdown and recovery cycles of 1 to 10 feet are common in pumping areas. Long-term drawdown effects, where the water table has reached or is attempting to reach a new level in equilibrium with the pumping, are apparent in parts of the basin. Since 2001, ground-water use in the upper Klamath Basin has increased by about 50 percent. Much of this increase has occurred in the area in and around the Bureau of Reclamation Klamath Project, roughly tripling ground-water pumping in that area. This focused increase in pumping has resulted in ground-water level declines in the pumped aquifer in excess of 10 to 15 feet over a large part of the Project between 2001 and 2004. If pumping rates of recent years are continued, the aquifer could achieve a new equilibrium; however, the final configuration of the water table (depth to water) and the spatial and temporal distribution of the resulting effects to streams are unknown. Historical water-level data suggest that the water table should recover from recent declines if pumping is reduced to pre-2001 rates. A ground-water flow model of the eastern part of the study area, where withdrawals for public supply have been proposed, was used to evaluate components of the water budget and to estimate the long-term hydrologic effects of hypothetical increased development. Results of the evaluation indicate conditions under which a new equilibrium would be established if 15,000 acre-feet of water were withdrawn from the Fish Springs Ranch area annually. The model indicates that, as a result of such an increase in pumpage, water levels would decline more than 100 feet from present (1988) levels in the vicinity of the pumping, and as much as 40 feet at the California-Nevada State line. Evapotranspiration and subsurface outflow to the east would each be reduced by about 60 percent, but hydrologic effects would be minimal at the western boundary of the flow-model area (just east of Honey Lake). Within the modeled area, the simulation indicates that the increased withdrawals would cause the net flow of ground water eastward across the State line to increase from about 700 acre-feet per year to about 2,300 acre-feet per year. 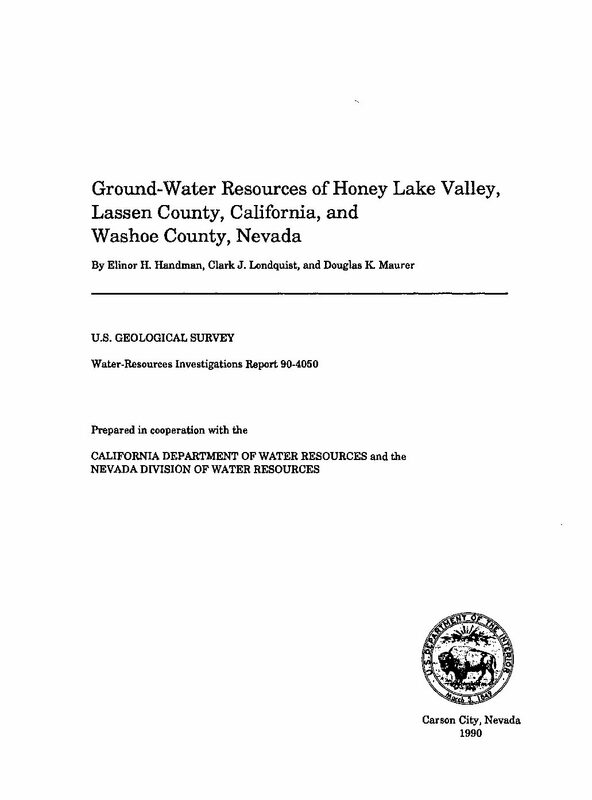 In the late 1980's Washoe County, Nevada, entered into an agreement with a private water development company to develop and export groundwater from the Nevada portion of the arid Honey Lake Valley to the rapidly growing Reno-Sparks area. The proposed project is known as the Truckee Meadows Project (TMP). Honey Lake Valley is 35 mi north of Reno, Nevada; but is located predominantly in California. 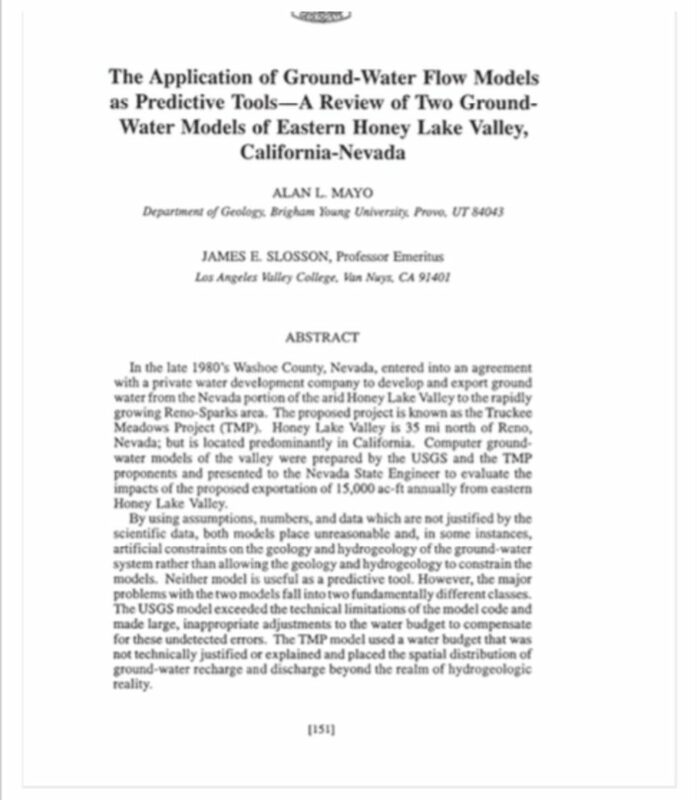 Computer groundwater models of the valley were prepared by the USGS and the TMP proponents and presented to the Nevada State Engineer to evaluate the impacts of the proposed exportation of 15,000 ac-ft annually from eastern Honey Lake Valley. By using assumptions, numbers, and data which are not justified by the scientific data, both models place unreasonable and, in some instances, artificial constraints on the geology and hydrogeology of the groundwater system rather than allowing the geology and hydrogeology to constrain the models. Neither model is useful as a predictive tool. However, the major problems with the two models fall into two fundamentally different classes. The USGS model exceeded the technical limitations of the model code and made large, inappropriate adjustments to the water budget to compensate for these undetected errors. The TMP model used a water budget that was not technically justified or explained and placed the spatial distribution of ground-water recharge and discharge beyond the realm of hydrogeologic reality.